So, what's your latest snowfall on record? And what's your latest over 6"? Wow. That even impressive for where I live. BTW, if you wanna sound like the smart kid on the block, it's typically referred to as a 'diurnal spread or variation'. I'm actually hoping for a big forecast bust. Had enough winter fun this year. Unfortunately, it gets worse with the afternoon update, now 18-24" across the Valentine region. I did notice today people stocking up and getting fresh gas for snowblowers and other snow removal equipment. Good question so looked it up. May 28, 1947 was the latest measurable snowfall of 4". Greatest 24 hour has occurred several times 18" throughout the history most recently couple times in the 1980's. Problem with using the 24 hour total some storms extend beyond even last years April blizzard did dumping 11". Blizzard of '49 2-3 foot snow estimates and 20-foot drifts were common for most areas but storm lasted 2 days. Really, I can remember April snows even in the high desert near Utah border, however. So, if you get over 6, you'll be right on that 'once in a hundred years' thing. Any snow above 12" is rare, any month and would most likely be some kind of record in April. 6" not so much so depends on how much. I gave the latest occurrences was the question all those occurred in May not April. The storm track appears to have shifted north a little, and here in north central Minnesota we are now in line for 8-12 inches of snow rather than 1-3 inches forecast yesterday. Much bigger amounts further south and west. Blizzard warning for my area tonight. Look at the last line of my forecast for tonight. OCALA, that might be a record for you, right? Nah, we're on the downslope of the Florida range. We regularly get several feet a night in the spring. The MN Tornado Watch/Warning drill scheduled for Thursday, 4/11 has been canceled due to the winter storm. The backup day of Friday, 4/12 has also been canceled. No backup date is planned at this time. North Platte FCO put historical perspective out today, and just how rare this upcoming bomb cyclone is. This should answer some of the WeatherHost questions. anny quit working this afternoon. Again. What at time to quit. Expecting 50 MPH winds and snow. Goodland, KS showing Red Flag and Blizzard Warnings in immediately adjacent counties. About 60 miles west of us. Glad it isn't on top of us. I hate to see the daffodils and other spring flowers beat to death by the strong winds and the snow here. They are looking so good right now. ValentineWeather better have his winter blankets out. I can't recall this many advisories before. Especially with the B word. The winds coming with the big spring snowstorm will likely create some very big waves on Lake Superior and other problems in the Duluth area. 31° and very light freezing rain this morning. Meanwhile, the globally warmed airport has 34°. At least the freezing rain sensor works. Check out the humidity because the temperature is running high. It's a joke an airport sensor can be this bad. 4 inches so far. May be more later. A lot of schools canceling for tomorrow. 4am: 6-7" using the NOAA snowmelt equivalent chart. Anemometers both stations are frozen solid because of substantial freezing rain prior to snowfall. Airport hasn't reported anything since midnight, not even a trace and it's snowing heavily at times so their ASOS can't handle a storm like this either so don't feel so bad about frozen anny's. There are 2 Vaisala WXT 510's for sale on ebay. They are asking around $500.00. These are $2500.00 stations. These don't freeze up. They are Professional weather stations. Try low balling the guy if interested. You never know. I got a NIB one for $250.00 16 months ago. The only downside for me is that they are hardwired and are AIO systems. They work with Weather Display software. Do not buy if you are not prepared to do some work to get the system up and running. Thanks for the tip. I've tried to convert to WD software and ran into issues and gave up. Also not interested in an all-in-one. Darrera made a sonic unit but looks like it may no longer be available. 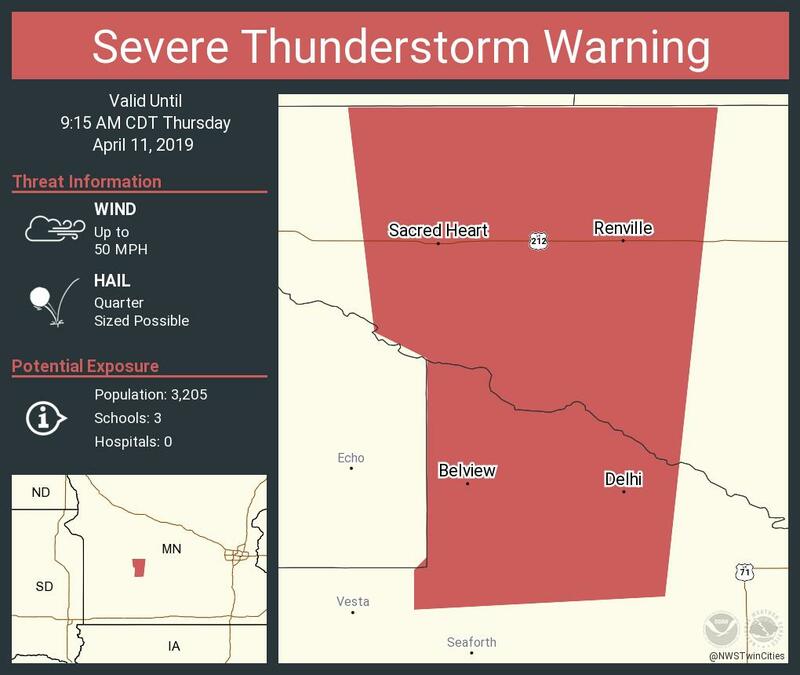 Western Minnesota is in a Blizzard Warning..... AND has a Severe Weather Warning. There is a tv station here that nominates "The most Minnesotan thing today" I think this wins. Found this for frozen anemometers at $94. 30' extension should be able to break free. 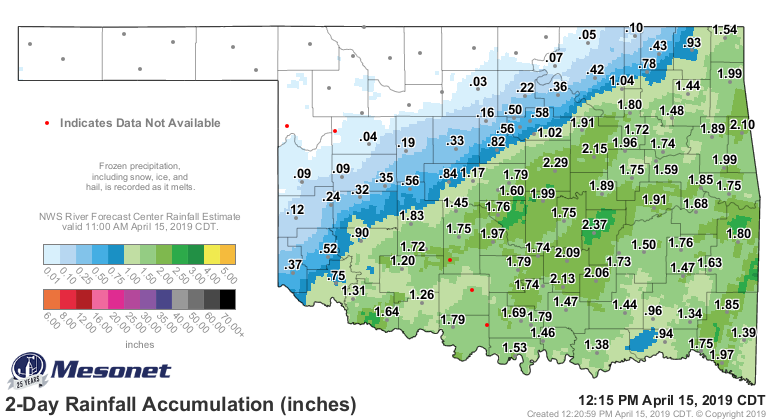 Saturday was a wet day for the southeast half of Oklahoma. Fortunately, it wasn't associated with any severe weather. Another good chance for rain comes Wednesday.